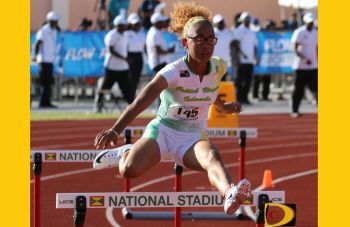 ST GEORGE’S, Grenada—After five athletes advanced to finals in the 100 and 400m at the 45th Carifta Games in St George’s, Grenada on Saturday March 26, 2016, there were no medals until Lakeisha “Mimi” Warner snatched silver in the first final on Sunday afternoon in the 400m Hurdles, to end her Carifta career. Warner split the Jamaican pair of Shannon Kalawan and Nicole Foster, to earn the silver medal in 58.14 seconds, solidifying her IAAF World Jr Championships qualifying mark, which improves her own national record. Kalawan ran 56.29 to break a 13-year old championships record. 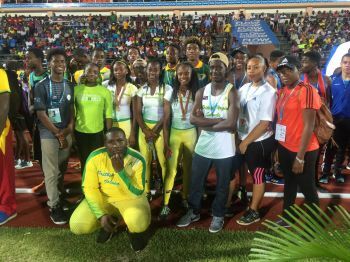 Before Warner’s medal, debutant Rikkoi Brathwaite and L’T’Sha Fahie were both fourth respectively during Saturday’s opening day of the U18 Boys and U20 Girls 100m dashes. Brathwaite—just the second VI male to make a 100m final in the territory’s 40 years of Carifta Games participation, narrowly missed a bronze medal by 0.03 seconds, finising fourth in 10.69 seconds. He dropped his best from 10.92 a week ago at the Elmore Stoutt High School inter-house championships, to 10.88 in the prelims to advance. The U20 Girls 100m final was a historic one for the Virgin Islands as the VI’s Nelda Huggins and Fahie, along with USVI’s Nia Jack, all advanced to the final. Jack ran a personal best of 11.70 seconds—which qualified her for the IAAF World Jr Championships later this year—to finish ahead of Huggins’ 11.80 as both advanced from the heat. Fahie rode a 3.2 meters per second wind and placed second in 11.71. Huggins aggravated her leg and skipped the final, where Fahie finished fourth in a 2.7 mps wind aided race, running 11.86. Jack ran 12.26 for seventh and suffered slight discomfort in her hamstring. After a personal best of 53.72 seconds in the U20 Girls 400m preliminaries, Tarika “Tinker Bell” Moses finished fifth in the final in 54.02. Judine Lacey won her U18 Girls 400m heat in 56.56 seconds, before leg troubles limited her effectiveness in the final where she ran 57.04 for eight. In the boys equivalent, debutant Rackeel Jack ran 49.57 to finish sixth, after advancing with 49.64 in fourth place. In the U20 Boys 400m final, Ronique Todman recorded a career best of 48.51 for sixth after running 49.11 to advance. K’Cei Moses was a non advancing sixth in his U18 Boys 400m heat in 51.46 seconds. Counterpart Shaniyah Caul ran 1:00.06 in fifth. The VI pair of U18 Girls High Jumpers, Z’Niah Hutchinson and Xiomara “Gia” Malone, settled for 1.55m after missing 1.60. Zacharia Frett was among those not advancing in the 200m after finishing her U18 Girls race in 25.14. K’cei Moses ran 22.45 for fourth in his U18 Boys race. Todman’s 22.01 also did not make the finals cut. In Sunday’s U18 Boys Discus Throw, BVI’s Djimon Gumbs finished sixth with a heave of 16.20m. Kiwanna Emmanuel’s only legal U20 Girls Discus Throw measured 29.14m, as she fouled her other attempts. So at no time has she ever trained on the government track or attended the free government public school that had athletics that was the breathing ground for her current endeavors? Zero help huh..... I'm pretty sure they paid the for the athletes to go to CARIFTA, as well as built a track for them to run on... I guess that's zero too..
Tarika "Tinkerbell" Moses also received a silver medal in the 800 meter final, so there were two female silver medalists. Mimi is the Golden Child, ok?? Media Darlin..... I'm happy for her but lord she gets all the publicity........ lol. But to defend her in this case, she did win the first medal for the VI (things were looking pretty brown up until that point) and she also broke a National Record (also Word Jr. Qualifier) while winning that medal. So she deserves the coverage. But yes, Tarika did well also. You people always have to stir up confusion! I am sure each athlete will get their time to shine in article as always happens if you check the archives. Excellent job to all who participated and to those who prepared them for the games. Well done! Thanks to ALL the athletes who represented us. GO, BVI !! Congrats mimi....i always ask your mom about your accomplishments whenever she comes shoppimg....go girl..always admire you..
2015 n 2016 carifta results;with government investment,is this satisfying results?look at Grenada and Guyana.input vs results. wasnt Josh Hill a part of the carifta team?? Hmmm.